The WebTeam is enjoying a much needed day off. Today and tomorrow are transition days for the Class of 2019. (Doesn't that sound so much better than Basics?) I thought I would let you know what is going on the next few days before classes start on Thursday and hopefully also answer some questions. I am posting this on both the WebGuy blog and Facebook. First off, I know many of you are wondering about phones. The answer at this moment is that it is up to each individual cadet squadron. Summer program groups including BCT squadrons disbanded at 1200 yesterday. 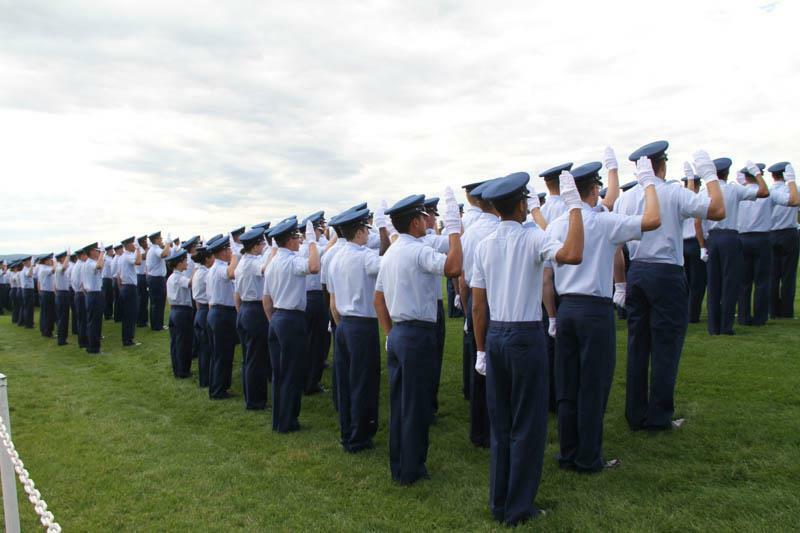 Academic year cadet squadron commanders assumed responsibility for their units at the same time. Demons, Barbarians, etc are no longer. Now the (still) Basic Cadets are members of Mighty Mach One, Phantoms, Tiger Ten, etc. 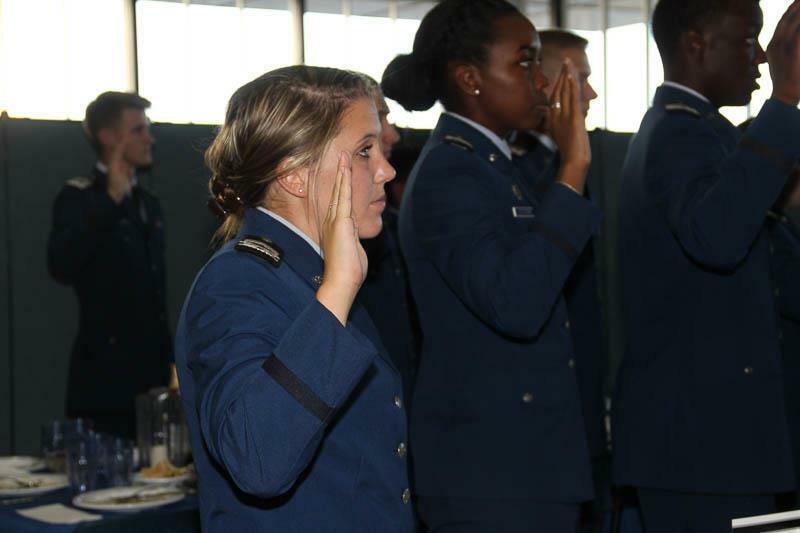 Check out your Parent Handbook for a full list of all the cadet squadrons. It is up to those cadet squadron commanders as to when they will have the use of their phones. That being said, I am confident that you will have contact with your cadet prior to Acceptance Day. I am equally confident that phone use will be highly restricted in the beginning. Please remember that phone use is a privledge not an entitlement, so help them obey the rules and keep that privledge. :-) Please also avoid the temptation to call the Academy or your Cadet's squadron to get more clarification. Remember my earlier post about distracting staff from the task at hand which now is getting the freshman processed into their squadrons and ready to start classes. So, here is what is happening between now and Tuesday. No pictures today. This morning they got up at a more normal time. Pretty sure it was actually light out. Breakfast was at 0700. They still have to be escorted everywhere they go until after the Acceptance Parade. They are also still not allowed to interact with upper class cadets other than those who were BCT cadre until after Acceptance. After breakfast it is church or free time in the dorms until lunch at 1100. This afternoon it's briefings on a variety of academic year topics, auditions for show choir for those interested and a briefing from the Athletic Director for all IC athletes. After dinner, there are Drum & Bugle Corps auditions for those interested. Taps is at midnight. Monday morning is really the beginning of the academic year. Fall airmanship programs begin at the airfield for upper class enrolled in those. (We will be covering those programs throughout the academic year). Freshmen will spend the day being issued and setting up their computers and room keys, going to the warehouse for more issue items, meeting with their academic advisors, getting orientations to Fairchild Hall (the academic building), and the McDermott Library. Basically the same things that all incoming college freshmen have to do. Until now their days have been managed for them every minute. Now they have to begin to manage themselves. There are also Cadet Chorale auditions. It is a full schedule until TAPS at midnight, but there is lots of individual time built in plus whatever briefings each individual squadron has. It is also a very full day schedule wise. In addition to the Acceptance Parade and family time, there is textbook issue, computer training, clothing issue, mandatory briefings, IC practices, plus optional auditions & rehearsals. Wednesday looks much like Tuesday minus the parade. 4th Class Cadets (whoo hooo) begin running the strips, greeting upperclass and all the other 4th Class responsibilities, but they don't need to be escorted any longer. All cadets will have briefings leading up to the first day of classes on Thursday. Thursday night is the Commitment Dinner for the Class 2017. It is a very important milestone and a decision point. Once the Class of 2017 reports for class the next day, they can no longer leave the Academy (willingly or unwillingly) without incurring a financial obligation to repay the cost of their education. They are "All-In". Hence the term "Commitment". We will be there to cover the dinner. The photos will be in a special gallery on the 2017 class page. Lastly... What to expect from WebGuy. During the academic year we will have something for you to see every week, but not necessarily every day. We try to balance our coverage between Academics, Military Training, & Extra-Curricular activities like club sports, squadron activities, intramurals & anything else we're invited to cover. As I have said many times, WebGuy's goal is to provide a window into cadet life, but not necessarily a window into the lives of each individual cadet. They deserve their privacy as they focus on the task at hand. That being said, you should have lots of pictures for your scrap books when we're finished in May. Ok. That's it for now. Thanks for all the kind words in your Facebook comments, and all the goodies and treats. We read everyone. We will continue to use FB to communicate during the year. Now, I am back to my day off. See you all soon. We'll have full coverage of Acceptance Day and hope to meet many of you at the Parade and also at the WebGuy Social during Parents Weekend.